On Wednesday night the Eastlake freshman team leapt out to a 33-0 lead versus Redmond and cruised the rest of the way to an easy victory. On Wednesday night the Eastlake freshman team leapt out to a 33-0 lead versus Redmond and cruised the rest of the way to an easy victory. The final score was 47-17. Eastlake received the opening kick-off and embarked on a business-like drive seven play drive that netted three first downs before culminating in a short touchdown run by Austin Gray. Instead of a routine extra point attempt, holder Vini Monteiro passed the ball to Jack Rud in the end-zone for a two-point conversion, staking the Wolves to an 8-0 lead right away. 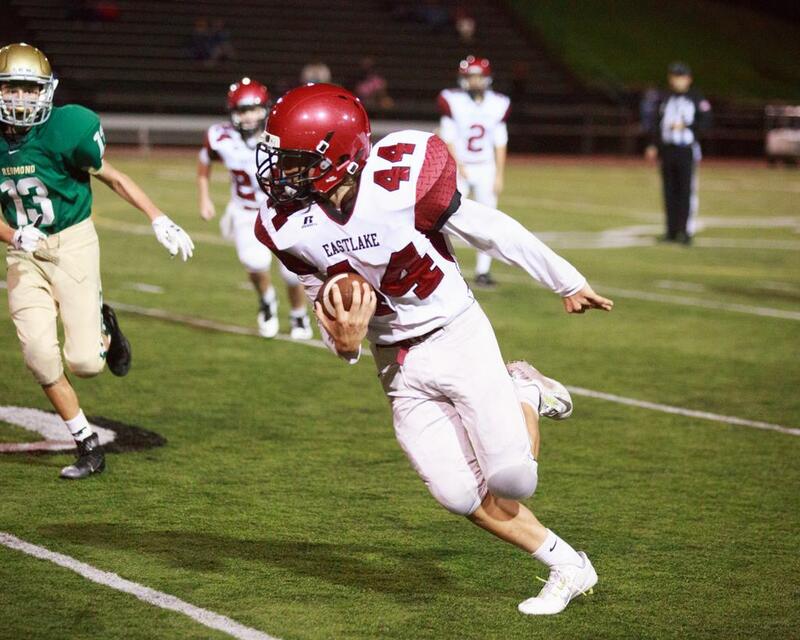 Redmond’s first possession ended quickly, as the Eastlake defense forced a three-and-out. Eastlake’s offense took over at its own 44 yard line following a Redmond punt. On the very next play Monteiro hit a wide open Rud with a perfect pass on a seam route. There wasn’t a Mustang defender within 15 yards of Rud and he easily ran into the end zone for a 56 yard touchdown. The ensuing PAT was blocked, leaving the score at 14-0. A long kick-off by Taige Thornton and good work by the Eastlake kick coverage unit forced Redmond to start its second possession at its own 21 yard line. Eastlake’s defense gave up nothing on first and second down, but on third down the Redmond quarterback hooked up with one of his receivers for a nice 27 yard gain. The Mustangs were less fortunate on their next third down, as Eastlake cornerback Nate Sutter picked off the Redmond pass. Three plays later Sutter scored on a 50+ yard touchdown run. A second blocked PAT attempt left the score at 20-0 a bit more than halfway through the first quarter. Redmond found itself starting with terrible field position again after another great kick-off by Thornton and more good work by the coverage unit. The Mustangs tailback managed to pop a 40+ yard run out to around midfield, but the Redmond drive was killed by two sacks in a row by Cade Prinzivalli from his outside linebacker position. 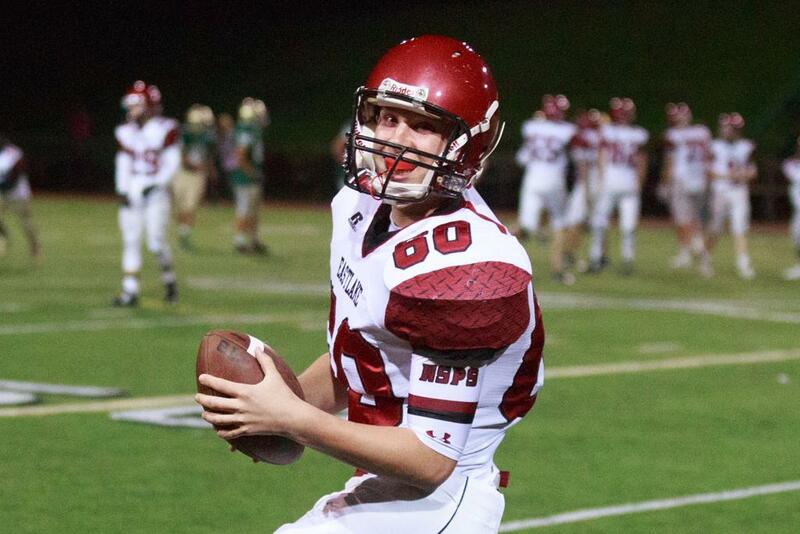 Following a Redmond punt and a penalty on Eastlake, the Wolves’ offense took over the ball at its own 11 yard line. The offense methodically worked its way out near midfield, with running back Andrew Plummer doing a workmanlike job of churning out the tough yards between the tackles. Monteiro then found Prinzivalli open on a go route and the receiver did the rest, running untouched for a ~60 yard touchdown. Thornton converted the PAT, leaving the score at 27-0 early in the second quarter. Redmond’s next possession began at its 37 yard line and ended quickly, as Rud intercepted a pass on the second play of the drive and returned it for an Eastlake touchdown. 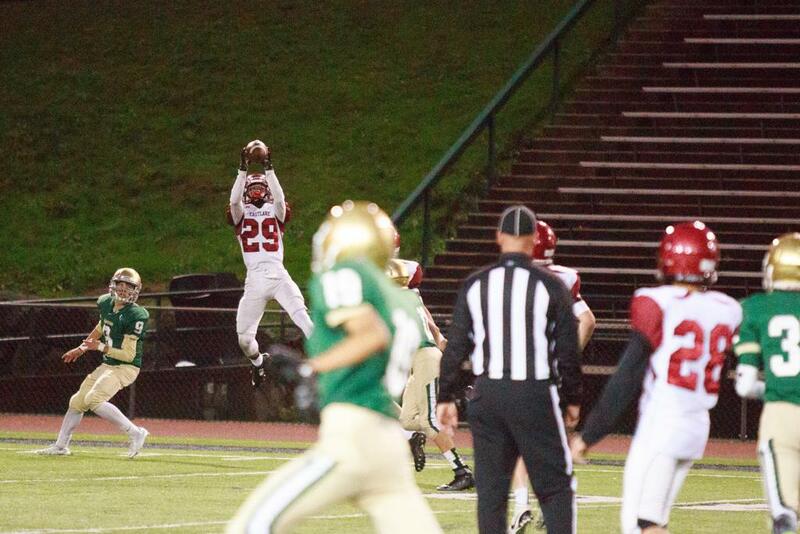 That was the second “pick six” for the speedy cornerback in as many weeks. The Wolves again attempted a pass out of their point-after formation, but this time it failed, leaving the score at 33-0. 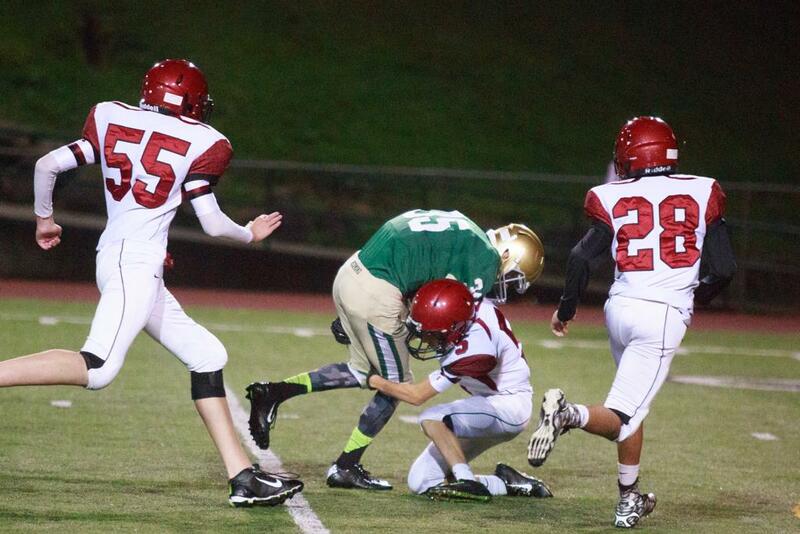 Following Thornton’s kick-off to the Mustangs the kicker was forced to make a touchdown saving tackle when the Redmond returner burst into the open. Fortunately, he was up to the task. Starting with good field position at the Eastlake 32 yard line, Redmond managed a first down before ultimately settling for a field goal from 28 yards. The Mustangs attempted an onside kick on the ensuing kick-off, but it was handled cleanly and smothered by Eastlake linebacker Justin Lewis. The Eastlake possession that followed lasted eight plays but ended with an Eastlake punt down to the Redmond 8 yard line. With time winding down in the first half Redmond mounted its most impressive drive of the evening, with two straight completions covering a total of 60 yards or so. The scoring threat ended as Lewis and Jalen Young combined to sack the Mustang quarterback on the final play of the first half. Eastlake took possession at its own 35 yard line after Redmond’s kick-off to open the second half went out of bounds. On the second play of the drive Sutter took a hand-off on a jet sweep and slipped outside, zooming down the sideline for a 50+ yard touchdown. A great block by fellow receiver Prinzivalli was the key to springing Sutter for that big play. Thornton converted the Eastlake PAT to make the score 40-3. Redmond’s first possession of the half did not go well, as Lewis recorded another sack when the Mustang QB just folded up and collapsed, untouched, after the Eastlake linebacker leaped towards him on second down. Eastlake defensive end Garrick Teglovic sacked the QB again on the next play, leading to a Redmond punt. The Eastlake possession that followed ended on downs after just four plays. Redmond’s next possession was similarly futile, with Lewis sacking the QB again on first down and a bad snap for a huge loss on second down. 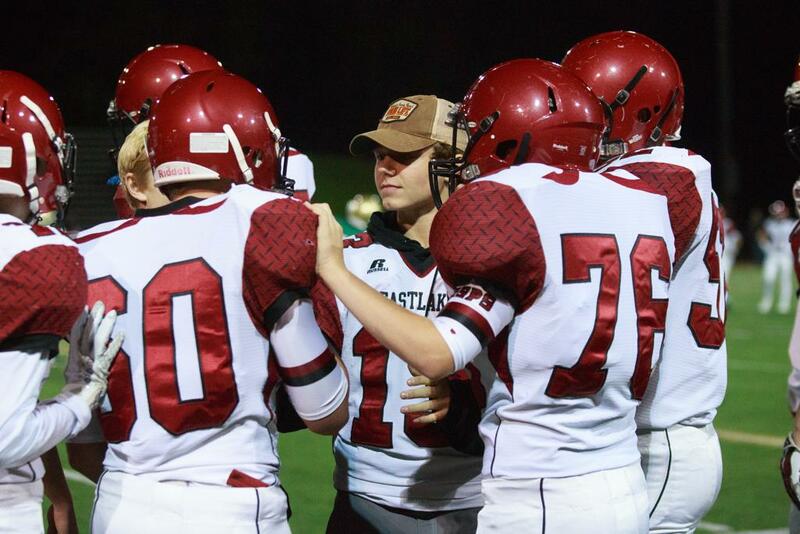 After failing to convert a third-and-long, Redmond punted the ball back to Eastlake. Eastlake’s offense took over at the Redmond 45 yard line and moved smartly up the field with big plays provided by Plummer on a nifty run up the middle and Gray on a swing pass that ended up covering almost 20 yards. The drive ultimately stalled and Eastlake turned the ball over on downs at the Redmond 11 yard line. After getting little on its first two downs, things were looking up for the Mustangs after their QB completed a pass on third down, but Eastlake Safety Carter Cox slammed the Redmond receiver to the turf short of the sticks. Bizarrely, Redmond’s offense took a delay of game penalty on 4th down that almost looked intentional, which turned it from a 4th and 1 to a 4th and 6. Redmond failed to convert on fourth down and Eastlake took the ball over at the Redmond 15 yard line. Eastlake scored quickly, with Monteiro passing to Sutter for a touchdown on 4th down. Another PAT converted by Thornton made the score 47-3. 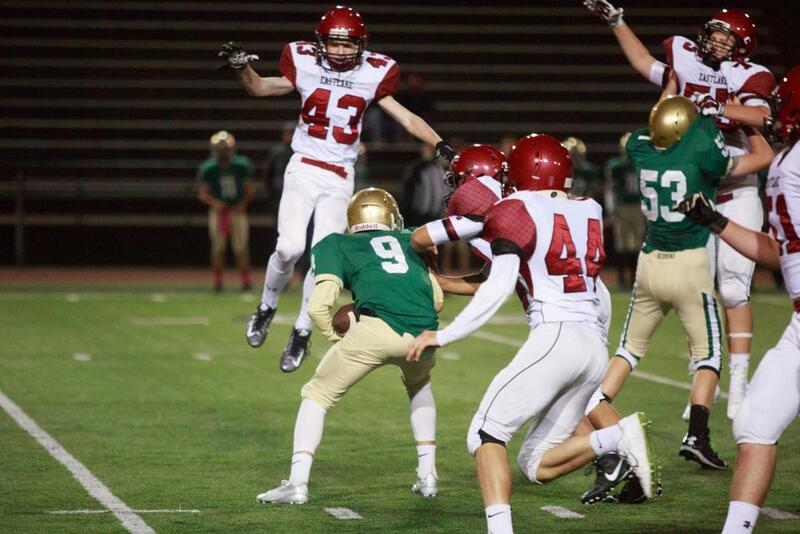 Redmond managed to score two touchdowns late in the 4th quarter, resulting in a final score of 47-1.